The Jamelia 2 light Art Nouveau style 2 light Tiffany table lamp features an intricate design in subtle colours and amber glass beads, teamed with highlighted bronze finish fittings. The large Jamelia Tiffany table lamp is a sophisticated Art Nouveau design, with glass teardrop jewels forming the rosebud design. Beautiful scalloped emerald edging with a warm natural contrast cream base. An elegant scrolled dark bronze finish base and two separate pull switches complete the design. 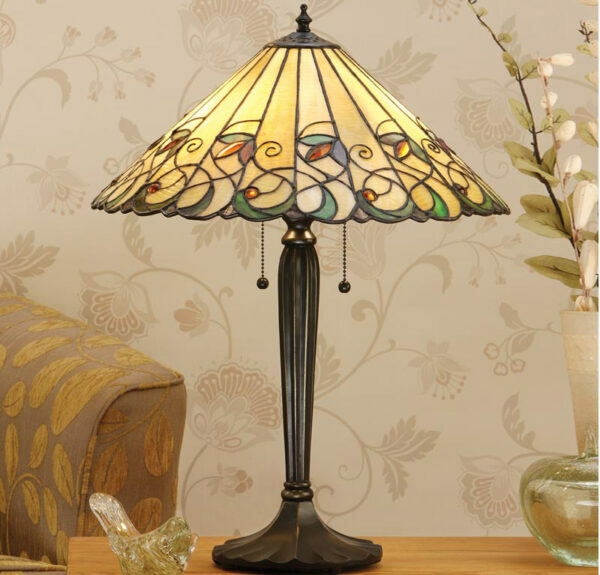 The Jamelia 2 light Art Nouveau style 2 light Tiffany table lamp, designed and manufactured by Interiors 1900.